Frequently cited as the toughest, most physically demanding of team sports, Rugby League in Australia certain gets the Aussies roaring as they see their favourite team pierce through the field towards the end of the line. The Australian National Rugby League is a premium club competition. Know more about the basic rules of the games and the Australian passion for Rugby. Rugby League is arguably one of the best known full contact outdoor sports in the world, mostly popular in Australia, New Zealand and England. Originating in England, Rugby league is one of the two codes of Rugby football, after splitting with Rugby Football Union in 1895. Rugby League has been played in Australia since 1907 with the first official match played on 8 May, 1909 in Brisbane between Past Grammers and Souths Logan Magpies. The year 1997 was unique to Australian Rugby league as it was split into two separate competitions: the 1997 ARL season and the 1997 Super League season. Later on, a peace deal between the two parties giving rise to the National Rugby League which is now the top league of professional Rugby in Australia. The NRL has since become recognised as the sport’s flagship competition and since that time has set record TV ratings and audience figures. A Rugby game is played with 2 teams of 13 players in each team. 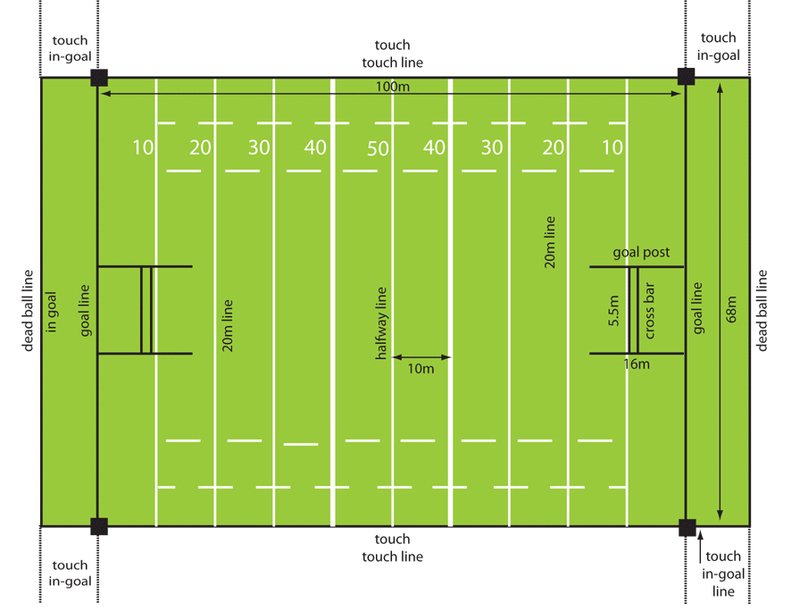 The playing field is rectangular in shape with 120 meters in total length and 58 – 68 meters in width depending on the field. There are 2 halves in the game each 20 minutes with a 10 minute break after which the teams swap ends. Play commences once the ball has been kicked off from the ground in the center of the field by one team to the other. Each end has a try line or goal line which is basically the scoring line. The try line has an H shape goal post that’s used for drop goals, penalty shots and conversions. Six to twelve metres beyond each goal-line is the dead ball line which creates the boundary with the sidelines. The area between these two lines is called the in-goal area, and varies from field to field. The gameplay is judged by 1 referee and 2 touch judges. The main referee has responsibilities like kit inspection, organising coins tosses, counting the number of tackles made and implementing disciplinary actions such as penalties. Touch referees move along the touch line following the play. They judge whether the ball or the player carrying the ball has gone into touch and whether the tries made by the attacking player is valid or not. They also stand behind the line to judge whether conversions or penalty kicks at goal have been successful. In most cases, an additional referee or a video referee is also used. The key responsibility of a video referee is to judge whether any goal attempt has been successful or not by closely monitoring the video recording of the event. The prime aim for the team in possession of the ball is to work their way from their side of the field towards the opposite end and score a ‘try’ by grounding the ball in the ‘in-goal’ area. The objective of the defense would be to prevent the opposition to score a goal and push the ball towards the opposite end as much as possible and most importantly, preventing a try. A 6 tackle rule is followed by the team in defense position. In this 6 tackle rule, the attacking team can get tackled only 6 times resulting in 5 plays to score. The referee keeps track of how many tackles are made after every restart. After the 5th tackle or the 4th play, the attacking player must kick the ball forward unless they see an opportunity to score a goal. If however, the attacking team finishes their 5 plays, a turnover occurs and the ball is taken charge by the opposition. The sixth tackle is mostly avoided and the ball is kicked forward as far as possible so that the ball is played from as close to the opposition’s end as possible. The play is halted after a successful tackle and the defense line, except for the 2 markers must move 10 metres towards their end of the field. ‘Play the ball’ is used to restart the play in various instances, in most cases immediately followed after a tackle. Play the ball is executed by rolling the ball back by the tackled player’s boot and the next phase of play begins. During ‘play-the-ball’ the attacking team must stop the forward process, place the ball on the ground in front of one foot and roll the ball backwards to his team-mate using his boot. A player may only pass the ball to his team mate behind him or across the field parallel to the goal line. Therefore the rest of the players on the team in possession must ensure that they are ‘on-side’, and in a position to legally receive the ball by staying behind or in-line with the passer. A pass deemed to have propelled the ball forward is called a ‘forward pass’ and results in an immediate halt to play and changeover of possession. In terms of scoring and gaining points, a try is worth 4 points where the ball is placed in the in-goal area using the hand or forearm, also referred as grounding the ball. If there is an illegal infringement before a certain try score, a penalty try is awarded directly under the posts regardless of where the offence took place. A player also has a chance to convert the 4 points into 6 through a conversion where he can kick the ball over the crossbar and between the uprights of the posts. A conversion is taken from a position perpendicular to the goal line opposite to the location that the try was scored. A converted try can be attempted from as close or as far from the goal line as the kicker prefers. In some circumstances, the team in attack may opt to kick a one-point drop goal instead of attempting to score a try. Scoring will at least involve first gaining field position and, in the case of scoring a try, will almost certainly involve breaking the opposition’s defensive line. When a team is awarded a penalty, they are given the choice of taking a two-point penalty kick from the point that the offence took place, or attacking with a set of six tackles in the hope of scoring a four-point try. This international competition is contested by national teams of members of the Rugby League International Federation and is held once in 4 years. There are currently 19 teams playing in the competition with Australia winning the prestigious title 9 times, the highest in history. This league that began in 1996 is the top level competition for rugby in England and is governed by the Rugby Football League, whose charge covers the United Kingdom as a whole. There are 14 teams in total in this competition. Super League starts from February and ends in September every year. The National Rugby League is the top competition of professional Rugby league in the region of Australasia and is run by the Australian Rugby League Commission. The competition is contested by 16 teams of which 15 are based in Australia and 1 in New Zealand. The NRL was formed in the aftermath of the Super League war. The season usually starts from early March every year till October in stadiums across Australia and New Zealand. The NRL grand final is one of the region’s largest attended sporting championship games. South Sydney Rabbitohs have the highest number of title wins with 20 titles in their name. Other big teams in the tournament are Sydney Roosters, St. George Dragons, Brisbane Broncos and Manly Sea Eagles.